Constructed of solid hardwood and wood veneers, this cabinet is designed for longevity. The rich, hand rubbed, multi-step black finish is perfect for blending with the family of furniture that is already part of your home. Brushed Nickel hardware adds a touch of style to this already beautiful cabinet. There is plenty of storage space and wire management behind the beautiful raised panel doors to hide electronic components, gaming consoles, DVDs and other items that you would prefer to be out of sight. 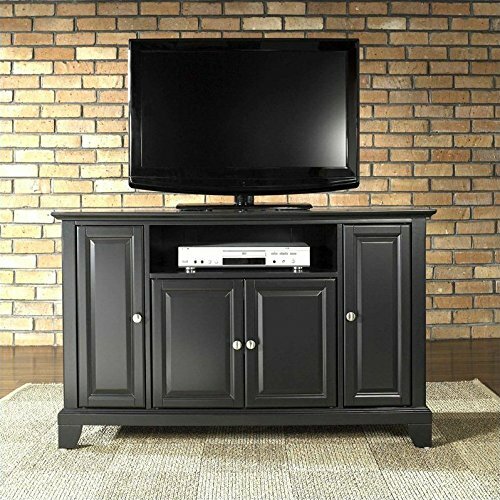 The 59 3/4-inch width means that this cabinet is perfect for most 60-inch TV's. This cabinet is not just for the TV room. The 36-inch height makes for great TV viewing in the bedroom. Behind the four doors, you will find adjustable shelves and lots of storage space for things other than electronics. Style, function and quality make this cabinet a wise choice for your home furnishings needs and is sure to be a part of your home for years to come. Constructed of solid hardwood and wood veneers, this cabinet is designed for longevity. 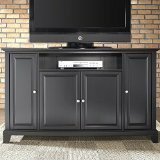 The rich, hand rubbed, multi-step black finish is perfect for blending with the family of furniture that is already part of your home. Brushed Nickel hardware adds a touch of style to this already beautiful cabinet. There is plenty of storage space and wire management behind the beautiful raised panel doors to hide electronic components, gaming consoles, DVDs and other items that you would prefer to be out of sight. The 47 3/4-inch width means that this cabinet is perfect for most 50-inch TV's. Style, function and quality make this cabinet a wise choice for your home furnishings needs and is sure to be a part of your home for years to come.